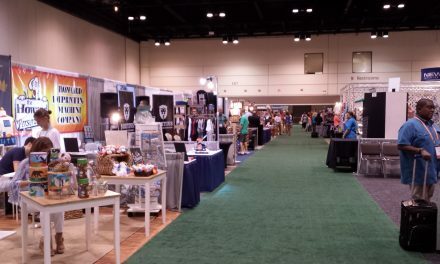 The popularity of Bible Art Journaling was very obvious on the ICRS showroom floor. 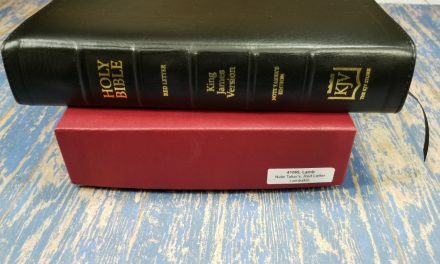 A large number of the bigger publishers (and some of the smaller ones) have coloring books, specialized journals, or journaling Bibles that have either released recently or will be released before the end of the year. I asked some of them which product they most wanted my readers to be aware of and here are their answers. 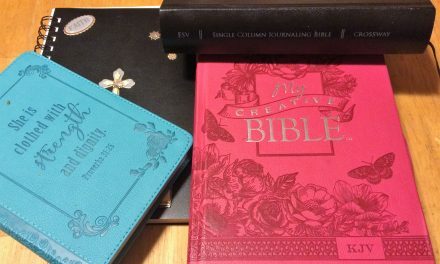 Christian Art Gifts makes the My Creative Bible, along with a wide assortment of journals and coloring products. They are very proud of their entire coloring book line but picked these two coloring books that are currently available. The Psalms in Color and My Favorite KJV Verses to Color have 62 perforated coloring pages each. DaySpring is very proud of their upcoming starter kit for journaling. A beautifully decorated cardboard box full of stickers, paint, starter sheets, and more. This is due to arrive in stores in the late fall just in time to make in onto lots of Christmas wish lists. Jann Gray was there in person giving demonstrations and is a wonderful person to talk to. She is so enthusiastic about people interacting with their Bibles on a personal level and encouraging people to be creative. She is looking forward to the release of a new product called “One and Done”. Each Kit will include 10 Reusable Tracing Sheets (at least 1 of which will be a complete alphabet), graphite paper and a tracing stylus. 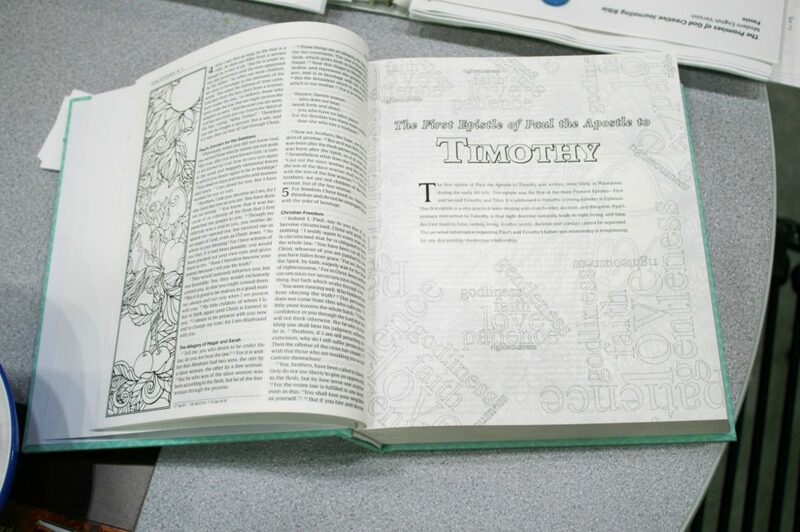 the images have been designed to fit in the margins of most journaling Bibles or to be used as pieces of larger projects. Jann loves these because it will give those who think they aren’t creative a way to have beautiful images in their Bibles while they gain the courage to try other things. There will even be a set of these exclusive to her workshops. Here’s a close up of the back of one of the kits. I will be attending one of Jann’s workshops in a little over a week with pictures of my project(s) from the workshop probably ending up in future posts. I also have a copy of her book Illuminated Journaling that I will be reviewing sometime in the next few months. Jann has an upcoming book about making Legacy Bibles. G.T. 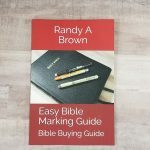 Luscombe has been in the business of finding high quality products for Bible marking for years. They are enjoying being part of the growing Bible art journaling movement. 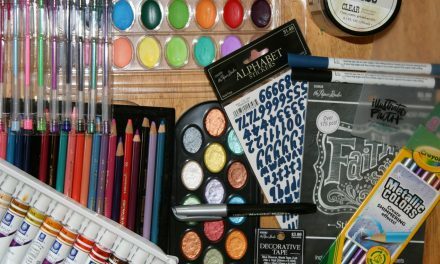 With advice from art journalers (like Jann Gray) they are trying to make art supplies that work well with most Bibles available to a large number of people. They are really proud of the wide assortment of art journaling kits they have compiled. This is a picture of their “Foundations Kit”. Complete with Micron pens, Zebra mechanical pencil, a white Jelly Roll pen, watercolors, sparkle pen, ruler, graphite and tracing paper, and coloring pencils with case, eraser, and sharpener it contains what most people will need to get started. They also have a “deluxe kit” for those who are willing to start big, a “no regrets kit” which is the other half of the deluxe kit so you won’t have to regret starting small and a new “trends – metallic kit” with all sorts of shiny products that is definitely going on my wish list. I’m hoping to have a post up soon with high-res photos and detailed lists of the contents of their kits. The only 2 items that make most start up lists they haven’t included are gesso and protective page mats but since they have researched so well what will and won’t work with most Bible paper those two items are less necessary with their products. Since they are one of the smaller publishers you might not have heard of them before but they make beautiful books. Working with various artists they helped get the Christian coloring book market started and are now featuring their first devotional. Wholehearted is a 30 day devotional by Jordan Lee of Soul Scripts with illustrations by Whitney Farnsworth. 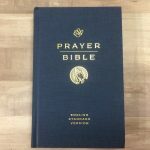 Besides the devotionals it has lined pages for your own thoughts and prayers after reading the devotionals, coloring pages, and key scriptures printed in the middle of pages for you to draw your own illustrations around. It’s a beautiful way for you to interact instead of just read. They also have a Hand Lettering 101 book that looks very interesting and were gracious enough to give me a copy of their Chalk it up to Grace coloring book by Shannon Roberts that I will be reviewing in the next month (or two). 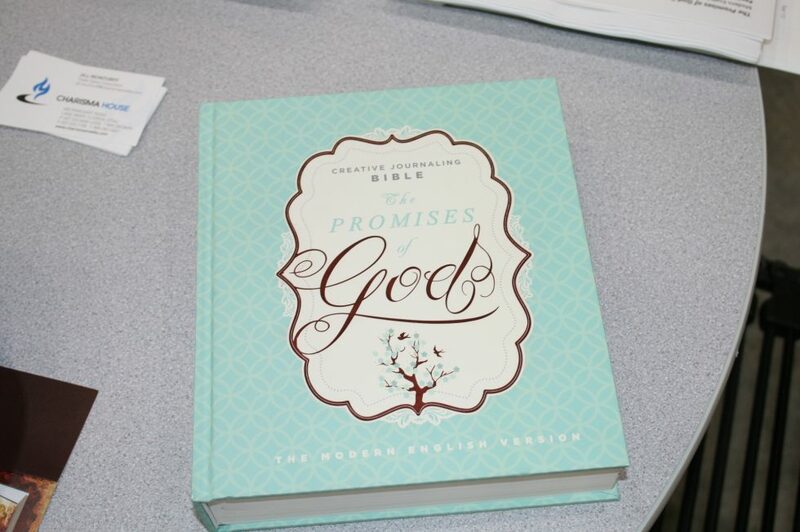 Passio will be releasing a new creative journaling MEV Bible soon called The Promises of God. It seems to be of comparable quality to the ones already on the market at a slightly lower price. The cover might change somewhat before this Bible releases. I’ll let you know for sure about the quality if we get a chance to review (color in) it. Wee Believers mostly produce gift items for children but they have a girls journaling set coming out that I thought was very interesting. Three different journals themed around Joy, Kindness, and Love each one has 137 pages. 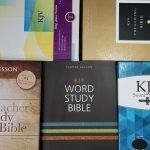 With scriptures relevant to the topic they contain pages for writing as well as a variety of activity pages including quizzes, crafts, coloring, and word searches just to name a few. If my (22 year old) daughter was a little younger at least one of these would be a Christmas present (If she didn’t have to have it before Christmas). Besides The Promises of God Bible there will also be a HCSB creative journaling Bible called Illustrator’s Notetaking Bible (in regular and teen) and an Expressions Bible from Hendrickson. Tyndale is also releasing their now familiar Inspire Bible in paperback and large print. With so many interesting items there is something for almost everyone and most of us will be very busy with our creative worship.